We have another great sketch for you this week at the Waltzingmouse Sketch Challenge (WMSC#45), this week it's all about tassels or whatever you'd like to have dangling from your card. Here's the sketch. I experimented with a few different tassels, pearl, bead combos but in the end I just went with some plaited seam binding! The papers are from Pink Paislee Butterfly Garden, I stamped some text from Text-It by Waltzingmouse Stamps in Tea Leaves VersaMagic. I also used one of the gorgeous labels from Very Vintage Labels No.18. 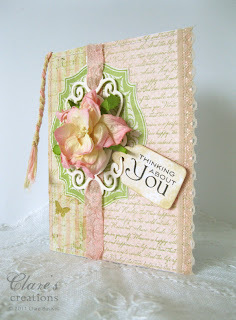 I layered a die cut from Spellbinders Fancy Tags Two over the label. The little tag is stamped with a sentiment from Fancy Phrases. 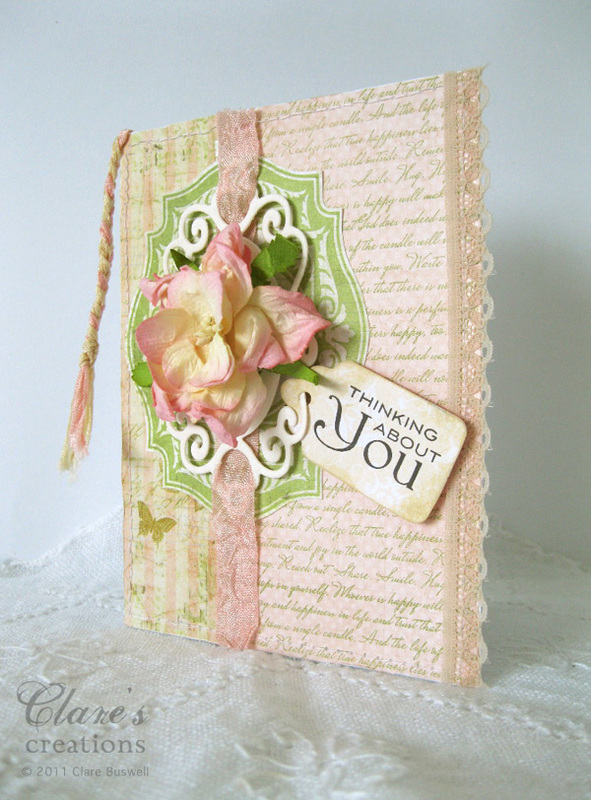 The pretty flower is from Wild Orchid Crafts. 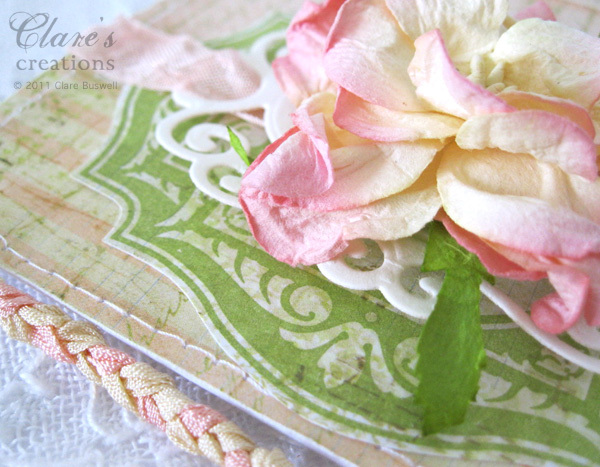 I added a little lace to the edge for my scalloped border. Oh and I threaded the scrunchy seam binding through the fancy tag. Other: Seam binding, Spellbinders Fancy Tags Two, die-cutting machine, Sizzix Bigz die scalloped labels, sewing machine, paper flower, lace, sticky fixers. 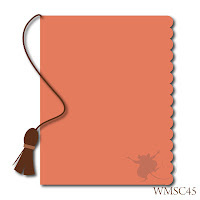 Oh, I love the tassel, and the gorgeous choise of colours is out of this world lovely! 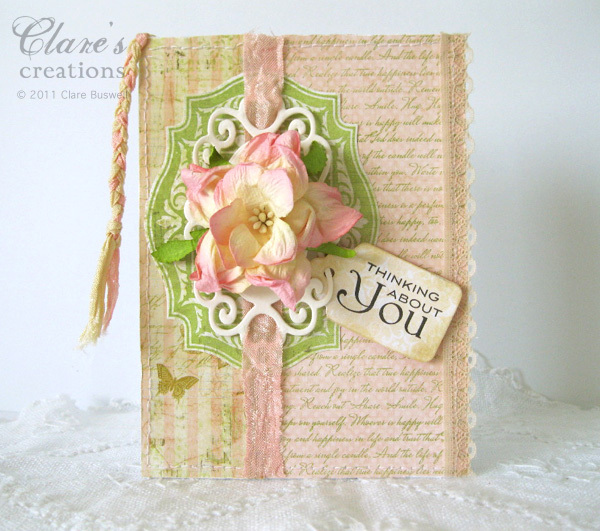 Fabulous card, Clare! This is lovely. Love the layers and your colors are divine. Some really Shabby loveliness. Very beautiful! So love this sketch! So pretty Clare! love your braided tassle and that gorgeous flower! So pretty! I love the soft pinks and greens you used! Fabulous Clare! Love the bright splash of green and that flower is absolutely gorgeous! 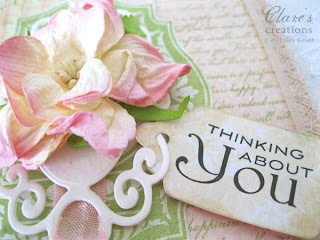 Sitting on your layered die cut shaping ... it's the center of attention!